The Everglades: Unique, Magical, Mystical. Photographs taken by Margaret Evans October/November 2009. It may take a lifetime to fully appreciate all that the Everglades National Park in southern Florida has to offer. The territory covers 1.4 million acres of water-covered land and is home to more than 300 species of birds in addition to numerous reptiles, invertebrates, mammals and innumerable species of trees and plants. The Park has been designated a World Heritage Site, an International Biosphere Reserve, and a Wetland of International Importance. This mosaic of mangroves, cypress swamps, hardwood hammock, and sawgrass wetlands is the only subtropical preserve in North America. Professor Margaret Evans is a faculty member in the Communication/Journalism Department at Shippensburg University. The photographs in this exhibit were taken during a fall 2009 sabbatical leave project in the Florida Everglades. 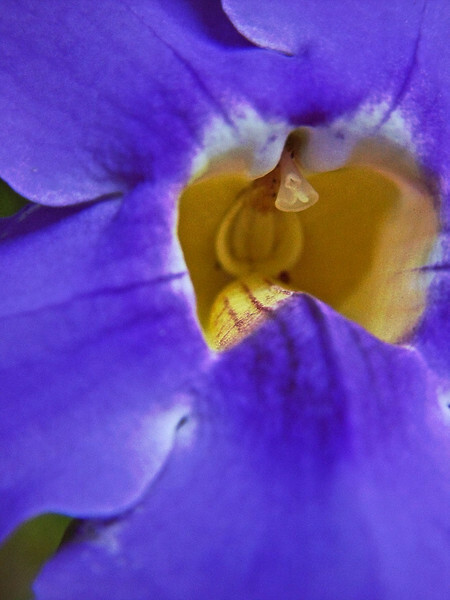 Inside a wild morning glory flower.